All nets and unhooking mats to be completely dry before fishing. All anglers to come to ticket/tackle shop before fishing. No braid to be used as main line. Micro barbed or barbless hooks only. 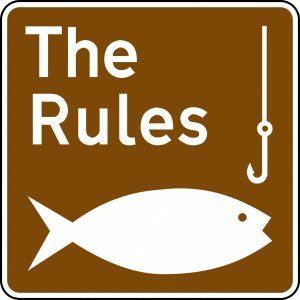 A minimum of 42″ net although 50″ is preferred especially if you are going for the catfish. Extra large padded unhooking mats carp cradles are preferred. Fish are to only be lifted 8 inches off the ground for photos and replaced back in to the water ASAP. Minimum main line 15lb for carp fishing. Minimum main line 20lb for cat fishing. No live bait (maggots and worms allowed). Definitely no rubbish or cigarette ends to be left in or by the swim. No fires – only barbecues that are off of the ground. Have the upmost respect for other anglers. Facilities are to be left clean and tidy at all times. Bait boats can be used, but please do not encroach on other swims. Radios are to be used at a minimum volume. Dogs must not come down to the main car park (tackle shop/canteen), and must be well behaved and cleaned up after! Weekends, including Fridays, anglers must leave at time of arrival on ticket. Any misuse of our fish or facilities will entail in you being asked to leave immediately. Any abusive or unreasonable behaviour will entail in you being asked to leave immediately. Cars parked in the various car parks are left at your own risk.